On 11th September Sasha Long from Ottobock came to provide teaching about the range of orthotics available to help MOTIONrehab® clients who live with Drop Foot. Drop Foot is a condition where the muscles around the ankle do not lift the foot during walking and therefore can cause people to trip, stumble or fall. It is common in many neurological conditions. Ottobock offers orthoses to support the upper and lower limbs after neurological injury or illness such as Stroke, Head Injury, MS and Spinal Injury. The use of orthotics complements Neurological Physiotherapy and can help progress rehabilitation. 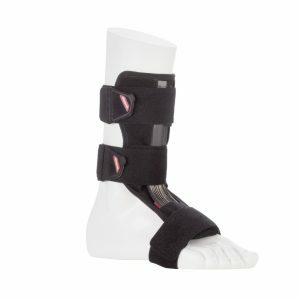 Ottobock have a wide range of orthoses in particular the use of Ankle Foot Orthosis (AFOs) for the management of Drop Foot. AFOs are designed to help correct the foot and ankle position during walking which can allow individuals to be more independent. All of the products will be available to trial in our clinics including the GoOn. The GoOn is a mild Drop Foot support that lifts the foot upwards to aid dorsiflexion (foot-lift while walking). It can be used to treat Drop Foot caused by mild symptoms of a number of conditions such as Spinal Cord Lesions, Traumatic Brain Injuries, as well as Stroke survivors and the elderly who have lost some of their ability to lift their foot when walking. It is easy to fit and apply, lightweight, washable and durable, plus its universal sizing means one size fits all. For more information on how MOTIONrehab® can help with your rehabilitation call 0800 8600138.